Residents attending Monday's Memorial Day parade in Kennebunkport, down the road from Bush's summer home, expressed concern for the nation's 41st president. The hospitalization of former President George H.W. Bush caused him to miss out on the local Memorial Day parade that he traditionally attends. The 93-year-old was taken to a hospital Sunday after he experienced low blood pressure and fatigue. A spokesman said he'd likely be in the hospital for a couple of days for observation. There was no immediate update on his condition on Monday. Bush tweeted Monday evening how much he missed being at the parade. Very much regret missing the Memorial Day parade today in Kennebunkport, and am forever grateful not only to those patriots who made the ultimate sacrifice for our Nation -- but also the Gold Star families whose heritage is imbued with their honor and heroism. The event's grand marshal, Tom Willey, mentioned the president in his remarks, wishing him a speedy recovery. "He's such a figure at our parades. He was definitely missed," said Shawn Hayes, vice commander of American Legion Post 159. Bush arrived for the summer in Maine on May 20 without his wife of 73 years, Barbara Bush, who died in April in Houston. 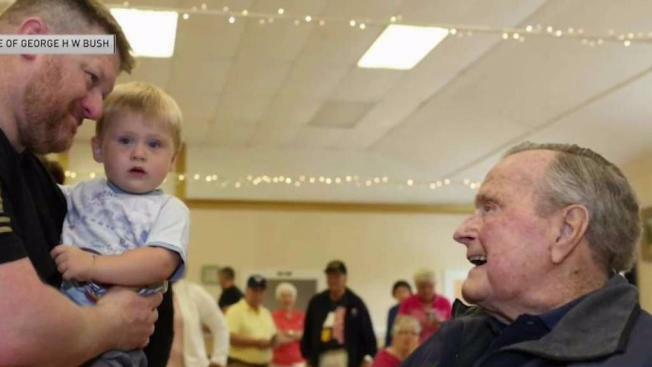 The day before his hospitalization, Bush attended a pancake breakfast at the local American Legion hall. His former national security adviser, retired Air Force Lt. Gen. Brent Scowcroft, joined them. Bush was a Navy pilot in World War II and survived being shot down over the Pacific Ocean. His two crew members perished.